Notebooks, video conferencing and makerspaces top the list. Notebooks and video conferencing are among the hottest technologies in education right now. That’s according to four experts who figuratively duked it out during a panel discussion Wednesday to determine “what’s hot and what’s not” in K–12 technology. 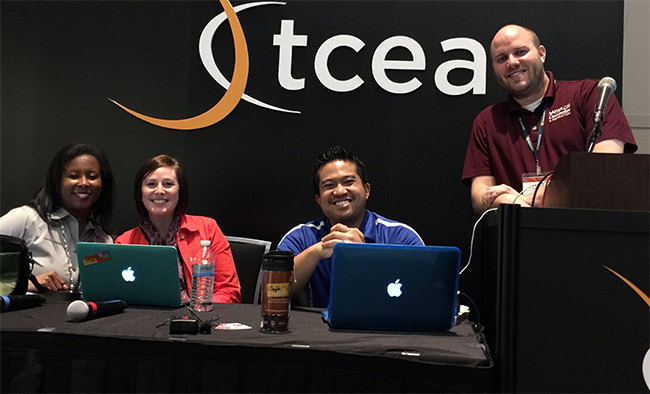 The fast-paced debate, which was held on the fourth day of the Texas Computer Education Association (TCEA) 2016 Convention and Expo, took place between Chad Jones, director of technology development at Lamar Consolidated Independent School District; Tong Utakrit, dean of students at Houston Christian High School; Jessica Johnston, instructional technology specialist at Brenham Independent School District; and Rachelle Wooten, digital learning specialist from Houston. What’s Hot in Education Technology? The session touched on everything from 3D printing and robotics to makerspaces. But notebooks and video conferencing were the real stars. All four panelists agreed, too, that video conferencing was in the “hot” — or green dot — category. There are several options for video conferencing, including Google Hangouts, Utakrit said. The solution doesn’t have to break the bank. “Use what you’ve got. Take advantage of these opportunities,” he advised. On the subject of 3D printers, which were hot in the exhibit hall at TCEA, the panelists were evenly split between hot and not. Wooten said the printers “make technology real and applicable,” while Johnston said she was in the not category until the market grows and prices come down. Most of the panel was also hot on makerspaces, agreeing that the technology encourages creativity, collaboration and achievement and doesn’t have to cost a fortune to get started. Jones said he was still on the fence, however, until educators could show the value of makerspaces. “We have to do a better job of selling how makerspaces trick kids into learning,” he said. Finally, the panelists all were in favor of teaching students to code.